ABC Central Florida has you covered! Rooms are available for a variety of uses and number of attendees, for small gatherings of up to twenty people, as well as for larger gatherings of one hundred or more. Tables and seating are provided. Ice, coffee, food (bring your own or have it catered), presentation equipment, and beverages may be requested (at additional costs). Tables and seating may be configured into a variety of setups, depending on your group needs. Rooms are available Monday through Saturday, from 6:30 a.m. to 9:00 p.m.
Don’t let criminals take advantage of your unprotected jobsite if it is over 1 acre! Make the crimes of petty theft and trespass third degree felonies in the state of Florida by properly posting a site as a designated construction site. ABC Signs are printed on Coroplast lightweight plastic with corner metal grommets and weather resistant for Florida use. Display the ABC logo, advertise your job as a merit shop construction site, and post your warning – all with one sign. These reusable signs are 3 ft. by 2 ft. and highly visible from the street. Signs are $16.95 plus sales tax and ABC members save 20% by buying by the box of 25. These three-color signs comply with Florda Statues Section 812.014 and Section 810.09 (d) for jobsites over one acre. Jobsites one acre or less require a different “no trespassing” sign. These three-color signs comply with Florida Statues Section 812.014 and Section 810.09 (d). 810.011 Definitions.–As used in this chapter: (5)(a) “Posted land” is that land upon which signs are placed not more than 500 feet apart along, and at each corner of, the boundaries of the land, upon which signs there appears prominently, in letters of not less than 2 inches in height, the words “no trespassing” and in addition thereto the name of the owner, lessee, or occupant of said land. Said signs shall be placed along the boundary line of posted land in a manner and in such position as to be clearly noticeable from outside the boundary line. *Please note: Florida Statutes 810.09(2)(d) says that construction sites one acre or less require different signage — THIS AREA IS A DESIGNATED CONSTRUCTION SITE, AND ANYONE WHO TRESPASSES ON THIS PROPERTY COMMITS A FELONY.– should be in letters not less than 2 inches high and posted where the building permit is located. Endorse a “Safety First” attitude with these lightweight Coroplast three color signs with both Spanish and English on the same sign. These 12” x 12″ diamond shaped signs are only $9.99 each plus 6.5% sales tax and ABC members save 20% by buying by the box of 25. $9.99 each plus 6.5% sales tax. Keep up with OSHA and Department of Labor regulations by posting the required notices. 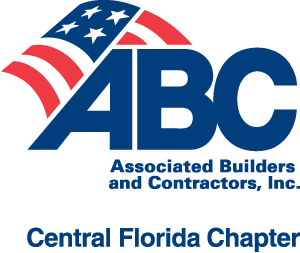 Show your ABC colors by including the ABC Member Logo on your website, vehicles, hardhats, stationery and other printed materials. ABC members in good standing may use the ABC Member logo, a trademark of the association, for the purposes of advertising and promoting their relationship with ABC. Is your membership plaque up to date? Are you displaying your membership plaque at each branch office? CFC ABC members may request ABC member decals at no charge for hard hats, tool boxes, cars, front door windows, etc. No Charge to Central Florida Chapter members if ordered through the Chapter office. Show your ABC colors by including the ABC Member Logo on your website, stationery, and other printed materials. ABC members in good standing may use the ABC Member logo, a trademark of the association, for the purposes of advertising and promoting their relationship with ABC. In doing so, a member must maintain the same basic requirements outlined in the ABC Graphics Standards Manual and remain a member in good standing. ABC logos may not be used by members in a manner to imply an endorsement of a product or service. ABC retains the right, at its sole discretion, to terminate the licensed use of the logo if a trademark is not used as prescribed by ABC. To obtain a logo, please email logorequests@abccentralflorida.org and specify your logo format preference(s) from the list below. Once your membership is verified, you will receive the logo(s) via email.